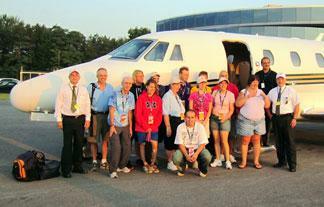 Indium Corporation participated for the third time in the Cessna Citation Special Olympics Airlift. The airlift provides transportation to over 3,000 athletes from all over the country, transporting them to the US National Games held on July 18 – 23 in Lincoln, Nebraska. The Cessna Citation Special Olympics Airlift involves over 250 private jets, making this event the largest civilian peacetime airlift in the world. The airlift provides transportation for Special Olympics athletes to the games and then back home after the closing ceremony. According to Indium Corporation pilot Will Payne, "It is extremely rewarding to be able to offer athletes transportation to these national games. Indium Corporation is honored to be a part of this event." The Special Olympics USA National Games provides an opportunity to showcase and celebrate the Special Olympics movement and athletes from across the United States. It also illustrates the power of sports to educate and inform about the true abilities and achievements of people with intellectual disabilities. To learn more please visit www.2010specialolympics.org. Special Olympics is an international organization that changes lives by encouraging and empowering people with intellectual disabilities, promoting acceptance for all, and fostering communities of understanding and respect worldwide. Founded in 1968 by Eunice Kennedy Shriver, the Special Olympics movement has grown from a few hundred athletes to more than 3.3 million athletes in over 170 countries, providing year-round sports training, athletic competition and other related programs. For more information visit www.specialolympics.org.